The story is familiar to anyone who has ever sat down to listen to a loremaster or storyteller. Four hundred or so years ago, the entire known world had been conquered by the greatest empire to ever be seen. The name of the Empire has been long lost to time, as has many of it's accomplishments, but some things are known. The Empire was the pinnacle of human accomplishment. Some say the streets were paved with gold, and peace and prosperity reigned. Progress and development were at their height, thanks to the learning and cleverness of the magi, the most esteemed men of the Empire, second only to the Emperor himself. They built wondrous machines, made miracle concoctions, and performed other feats that, by all accounts, would seem magical. What caused it to collapse is hotly debated by men to this day. Some blame the collapse on the hubris of the magi, and the society they lived in. Others blame it on their decadence. Yet all can agree that the catalyst was the arrival of the Qantari. Said to be demons from the underworld, with descriptions varying widely from storyteller to storyteller, the Qantari invaded the Empire from across the sea, laying waste to all they encountered. The Empire fought back bravely, but just as they were on the cusp of victory, the Qantari called their dark gods to assist in their war effort. In response, the Empire received the help of the High Lords. Their nature, too, is hotly debated- some take them for gods, while others take them for something less, if still amazing. Whatever they were, none can dispute that they took to battle on the side of the Empire. With their help, the Qantari and their masters were driven back to the sea, never to be seen again. Yet the victory was not without cost. The land was devastated by the war. Entire cities had been lain to waste. Maadoran, once the shining capital of the Empire, had been reduced to a near lifeless desert, and it's most esteemed district, the residence of the magi, reduced to a terrible crater of death. The wonders and knowledge of the magi were lost, and the Empire itself was reduced to feuding noble houses, all vying to pick up the few pieces that remained. Four hundred years later, very little has changed. The magi are long gone, as is the Empire, and the once great noble houses still squabble and compete for power. The Imperial Guard, once the mighty Imperial Army, can only stand on the sidelines and try to maintain the peace. 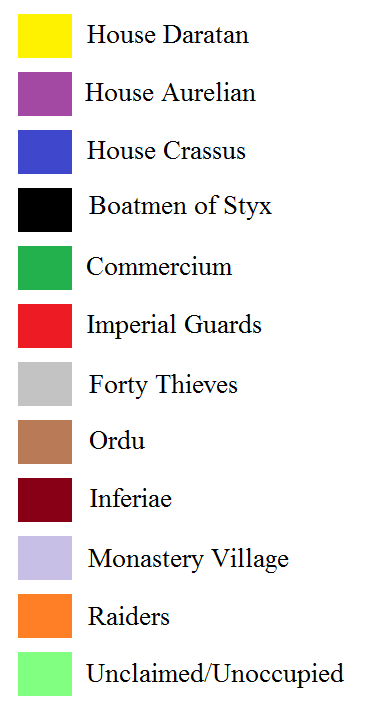 The various guilds of the world, meanwhile, find themselves with no shortage of work, be it engaging in assassinations, smuggling operations, or just general commerce. Yet even as humanity clings to survival, and even tries to pull itself back on it's feet, the wonders of the old world lay buried. Though much had been picked clean over the centuries, the most wondrous of prizes may still lay buried. And for those who can find them, the fate of the world may just rest in their hands. The Age of Decadence is a CRPG based in a low magic, post-apocalyptic fantasy world. It is now also a forum game here on Molotov, based in the same setting. Within this thread shall be a compendium of all information that is currently known to the world, or may soon be discovered by it. House Aurelian: The largest and most powerful of the noble houses, their total dominance of the old empire is curbed only by the combined counterweight of the other noble houses and the Imperial Guards to keep the balance of power. It is the belief of Lord Gaelius, the head of House Aurelian, that the artifacts of the old empire and the hubris of those who used them are what brought about it's doom. As such, House Aurelian seeks to contain and even destroy relics of considerable power whenever and wherever possible. It is not simply their mission to unite and restore the empire, but to protect it and it's subjects from the worst threat imaginable- themselves. House Crassus: Under the leadership of "Brother" Meru, House Crassus has gone from a typical noble house to the head of a fanatic religious movement. Believing that the world is in the state it is in because the gods had chosen to abandon mankind, Meru and his devout followers seek to achieve moral and spiritual perfection, and to ultimately bring the gods back to the world, so that they may bring it out of the darkness. House Daratan: The weakest of the three noble houses, House Daratan is led by the ambitious Lord Antidas. Having failed a bid at reestablishing the old empire in the past, he now looks to uncover some fantastic weapon from the ruins of the old world which would finally subdue his enemies and earn him his rightful place as Emperor. Boatmen of Styx: Once the personal guard of the Emperor, the Boatmen have evolved into a guild of professional assassins. Willing to kill almost anyone for the right price, the Boatmen of Styx pride themselves on their efficiency and skill. With no central leader of the entire organization, but various guildmasters acting across the three major cities of the land, what agenda the guild follows is largely up to the local leadership. Commercium: The Commercium is a guild of merchants which has come to prominence only recently. Though lacking a storied history or nobility, they more than make up for it in the economic power they wield. Though lacking any central leadership over the whole organization, the masters of each city's branch cooperate efficiently to ensure competition is crushed and business is kept booming. With deep purses and few moral scruples, there seems little the Commercium isn't capable of. Imperial Guards: Once the military of the Empire, the Imperial Guards now act as defenders and peacekeepers. Under the command of Dux Paullus, the guard keeps raiders and the tribes of the north at bay, while maintaining an uneasy peace between the feuding noble houses. Though not capable of much on their own, with proper steps and allies, they could conceivably tip the scales in their preferred direction. The Forty Thieves: As a guild of thieves practicing in every major city, the Forty Thieves are generally able to act with surprising transparency. Having many of the guards of Teron in their pocket, and all the Slums of Maadoran in their hands, the Forty Thieves and their decentralized leadership find themselves difficult to dislodge. So expansive is their influence that they are at times even relied upon by officials to get tough jobs done. The Ordu: Hailing from the north, the Ordu are proud nomadic warriors who have perpetually pushed at the old empire's borders. Yet recently, the north has become less hospitable to them, and they now look south to greener pastures, and perhaps even a local benefactor who might care for them in exchange for their services. Teron: While once a decently sized city within the Empire, Teron has fallen into disrepair since the fall of the Empire. Though Teron has begun to see a slow but steady return to prominence under House Daratan, Teron is a long way from becoming what it once was, let alone what those in charge of it might dream it to be. Maadoran: Once the shining jewel in the Empire, Maadoran has fallen far, perhaps even farther than Teron. Though still an important city under House Aurelian, Maadoran is but a shadow of it's former self. Once fertile lands have been reduced to desert, an entire section of the city has been reduced to a miasma-ridden wasteland, and much more is firmly under the control of the Forty Thieves. Still, for all it's hardships, Maadoran remains the preeminent city of the former Empire. 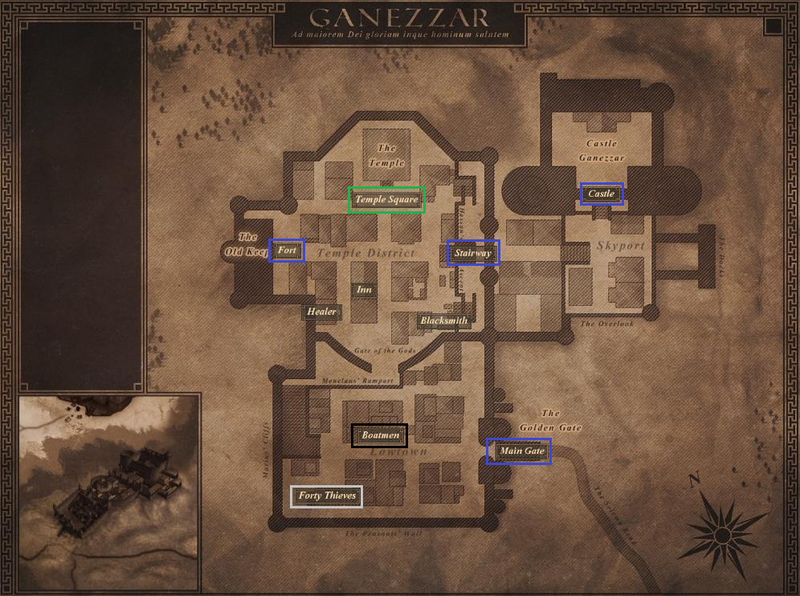 Ganezzar: Ganezzar is the third of the important cities of the former Empire, and serves as a formidable obstacle to infiltrate. It's fortified position on a hill, combined with hordes of faithful zealots occupying the lower quarters of the city, would make for a costly and difficult campaign for all but the most dedicated of armies. Still, the holy city is not as it could be, with the lower levels being little more than a shanty town for the faithful, whilst those above live in far better conditions, further exacerbating tensions between the two segments of society. Caer Tor: Acting as the base camp of the Imperial Guard, Caer Tor is less a town and more a military encampment, filled at all times with training soldiers and plotting commanders. Despite it's irrelevance as a civilian settlement, Caer Tor remains an important locale in the land. Ordu Camp: Though the Ordu are nomadic by nature, they can and do at times settle down to gather and prepare. From here, the Ordu look greedily to the south, looking at all times for an opportunity to slip past the encampments around the mountain passes, so that they can graze and raid in greener pastures. Harran's Pass: Though a small and under-staffed fortification, it is the only thing standing between the Ordu and the former Empire. A contingent of the Imperial Guards stands watch at all times, ready to fight against any Ordu incursion- or at least, to keep them at bay until reinforcements can arrive. Inferiae: Sitting in the middle of the wasteland, Inferiae has nevertheless managed to exist untouched by the raiders of the wasteland. Those who know of the location say that it is set around a portal to the underworld, and that the locals often sacrifice lone wanderers to earn their own protection. Whether they truly have the protection of the underworld, few raiders seem willing to test the tenacity of such a vicious settlement. Monastery: An old monastery in the mountains, legends have spread of mystical things within it, much to the frustration and inconvenience of those living in a village around it. They exist in self-imposed isolation, wary of any who wander too close. Outpost: An Aurelian outpost built around a mountain near Teron. 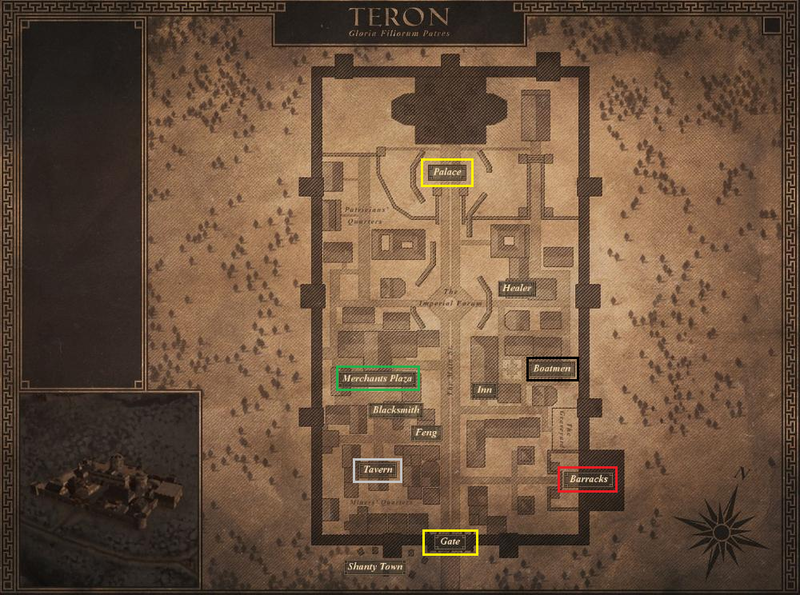 None outside the employ of House Aurelian seem to know what the purpose of this encampment is, yet it hardly seems to be in any position or with any intention to threaten Teron. Old Facility: Outwardly a camp for a small contingent of Aurelian soldiers, the modus operandi suggests that something of importance has been found, and the Aurelians are already at work to try and cover it up from prying eyes. Whether there is time or opportunity to find it, only time will tell. Village: Once a village existing outside of the purview of the three Noble Houses, it has met the same fate as many such unassociated settlements- ransacking and occupation by raiders. Yet they currently remain within the confines on the village, and none can guess why. 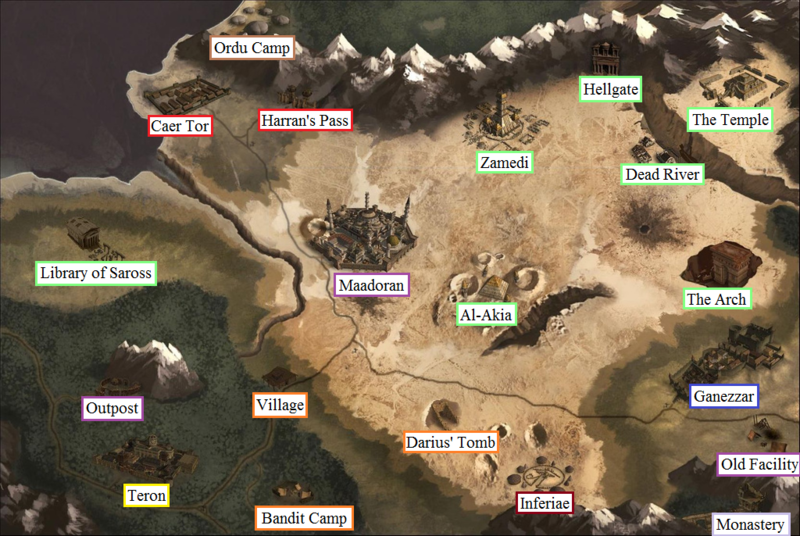 Bandit Camp: A makeshift encampment for a band of raiders, it has recently taken importance as the holding place of a kidnapped member of House Daratan. Though an unimportant relative, the insult can hardly stand, and few expect this to persist without some response from House Daratan. Darius' Tomb: Said to be the burial place of a great warlord named Darius, and the resting place of an important artifact known as the Helm of Destiny, it is currently occupied by a band of raiders who seem to have no knowledge of this. For those who know of this location, it seems a decent defense for the artifact until a team can be sent to retrieve it- for whatever purpose they may have. leaving only what was worthless enough to leave behind. Or, perhaps, what was too well-hidden to be found. The Arch: A massive structure standing in the wasteland, it's purpose has long been lost to time. It now serves as a gathering place for the curious and dispossessed with nowhere else to go. Yet lying so far from civilization, one wonders if this structure once served as more than decoration. it may serve as a place where the Gods can be brought back to this world. Dead River: As the name suggests, Dead River was once a settlement along a flowing river, now reduced to a barren and deadly pit. Few know what lie on the other side of the old river, and fewer are capable of braving the arduous journey across. Yet the strange priests who remain nearby speak of one who did just that, long ago- and managed to return alive. Hellgate: An imposing structure carved in the mountain, Hellgate is known only as a cursed place where few can venture and return alive. Those who have braved the place and returned to tell the tale speak of vicious beasts which could and have slaughtered dozens of men on their own. Whatever the truth is, few seem willing to return to this foreboding place. The Temple: A temple associated with Thor-Agoth the Artificer, it has been long lost and divided from the world at large. Yet those who have learned of it's existence and know of the High Lords would know of Thor-Agoth's association with machines, and the likelihood of many fantastic devices to be hidden there. For anyone with an interest in the relics of the past, discovering and dealing with this location is certainly a must.